Togolese international striker Emmanuel Adebayor has given Tottenham coach Andre Villas-Boas a boost by making himself unavailable for the African Nations Cup in January. The twenty eight years old threatened to quit the Togo national team if the players were not paid money owed to them by the nation's federation. 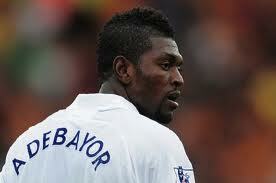 Adebayor has not been a regular starter for Tottenham since Villas-Boas took the reins this summer. He has made just nine appearances, but his availability is good news for Spurs as they target another top-four finish in the Premier League.